Arrival in Santiago de Chile and transfer to the hotel (seat in). In the afternoon food & culture walking tour to learn about its rich cultural history, while enjoying some wine and food. Excursion to Valparaiso and Viña del Mar and sightseeing in the twin towns. On the way there visit to a winery in Casablanca valley with wine tasting (seat in). Transfer to the airport (seat in) and flight to Calama (not included). Transfer from the airport in Calama to the hotel in San Pedro de Atacama (seat in). In the afternoon excursion to the Valle de la Luna and Valle de la Muerte completing the day by watching the beautiful sunset in the desert. In the morning ancestral medicine tour in Tebinquinche with a swim in the Turquesa Lagoon and a visit tothe Ancestral Medicine Center (seat in). In the afternoon ancestral caravan tour following old circuits in the Atacama Desert (seat in). Excursion to the Salar de Atacama, the Lagunas Altiplánicas Miscanti and Miñiques and the Piedras Rojas (seat in). Transfer (seat in) from San Pedro to the airport in Calama and flight to Santiago (not included). Upon arrival transfer to the hotel in Santiago (seat in). 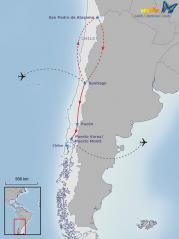 Transfer to the busstation in Santiago (seat in) and public bus to Pucón (without guide). Upon arrival transfer to the hotel in Pucón. In the afternoon hike in the native forests and visit to the Ojos de Caburgua waterfalls and the Caburgua Lake. Transfer to Trankurra, part of the Curarrehue community. Start of the 3-days Curarrehue-Program. On the first day hike to the Trapial lagoon and discovery of the national flower Copihue. Afterwards visit to a handicraftsman to learn about the local leather rpoduction and to a traditional orchad. Lunch and dinner within the community. Day 2 of the Curarrehue-pogram. After a traditional farmers breakfast visit to the Carilafken lagoon and hiking in the Villarrica Nationalpark with packed lunch to eat on the way. Dinner within the community. Day 3 of the Curarrehue-Program. Visit to a sheep farm to learn about the wool fabrication. Afterwards conversation and lunch together with the Longko of the community to get to know about their worldview. Then, traditional preparation of tortillas on ashes and Palín game. Afterwards transfer to Pucón. Public bus from Pucón to Puerto Varas (without guide). Excursion to the Petrohue waterfalls, sailing on the Todos Los Santos Lake and visit to the village Peulla with the possibility to participate in local activities (seat in). Full day excursion to the Chiloé Island with visit to the towns of Castro and Dalcahue, as well as the villages of Chacao and Nercón (seat in). End of the roundtrip. Transfer from your hotel in Puerto Varas to the airport in Puerto Montt.